Take the Super Nintendo – not only was there the Super Scope (a rocket launcher light gun type thing) and the Super Game Boy (which allowed you to play Game Boy games on the SNES) – but there were also certain other “adaptors” of a dubious third party nature that would let you play NES games too. The Mega Drive was also no stranger to having bits bolted on, and in this series of articles we shall briefly highlight some of those addons. First up, The Mega CD….. 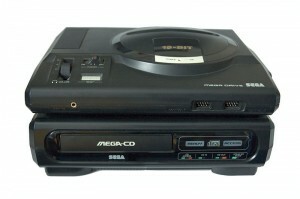 Released late in 1991, the Mega CD was designed to take gaming to higher levels and provide better graphics and sounds to enhance the gaming experience. This was the first console ever to deliver data on an optical disk. The use of FMV, or Full Motion Video, was very much taken on board and used as much as possible. Also by putting games onto CD’s more and more data would be able to be used and, as such, games should have been a whole lot better. Chuck in a fully functional CD player and you have a pretty dynamic piece of kit. However whilst all this sounded mind blowingly awesome back in 1991 when it was launched, the actuality of it all was something of a Mega disappointment. Developers were somewhat surprised by the capacity of the CD’s and after spending so long programming for cartridges, simply did not make enough use of the extra storage available. The decision to incorporate as much FMV as possible was also an error, whilst this might have looked impressive it was very limited in function and most of the games which used a lot of FMV were generally panned. That’s not to say the system was a total loss. Like the versions of Sonic that appeared on the Master System and Game Gear that were different from the Mega Drive original. Different Mega CD versions of Earthworm Jim and Spiderman Vs The Kingpin saw extra levels and scenes slotted in, and Sonic CD was for many probably the best Sonic game ever (which incidentally has been re-released on XBOX Live and Playstation Network to rave reviews). The Mega CD never realised it’s potential and for many games owners shelling out for a console and expensive games, it was a fad too far. The technology in place was perhaps at the wrong end of the life cycle and found itself struggling to compete with the very markets it was looking to push into, namely competing with PC games. 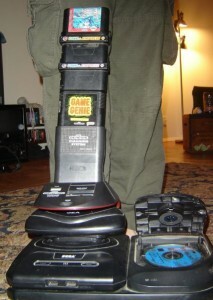 Although initially sales were good, Sega had already turned their attention to other add-ons and had one eye on the next generation of consoles, with the Sega Saturn becoming their next disk based machine to be released a few years later. Print article This entry was posted by RetroBear on March 18, 2012 at 8:54 am, and is filed under Retro Reviews. Follow any responses to this post through RSS 2.0. Both comments and pings are currently closed.